Chipotles are smoked jalapeño peppers. The native peoples of Mexico developed the method of smoking to preserve the chiles because, unlike other peppers, jalapeños don't dry well naturally due to their waxy skin. Water gets sealed inside and they tend to rot rather than dry. Chipotles are often stored "en adobo" which is a process of soaking them in vinegar, which reconstitutes them and creates a sauce. The spicy and smoky flavor goes well with meats and has become very popular as a sauce when mixed with mayonnaise in restuarants in the United States. 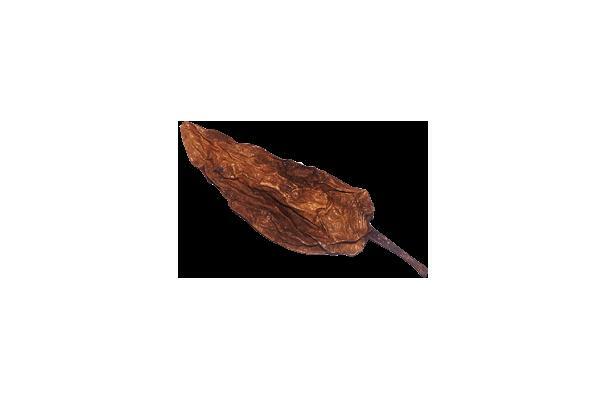 Dry: hard, brittle and tough, dark wrinkled exterior. Re-hydrated: soft, pliable, squishy. -In a variety of sauces. The wet (sauce/adobo) varieties are the easiest use. If dry, chilies should re-hydrated before use. Submerge in a dish of warm water or vinegar and weigh down with another dish so they remain submerged for about 20 minutes. When they are soft and pliable, they are ready to use. They can be toasted dry before hydrating to bring out more capsaicin and deepen flavor. Take caution when cooking with canned chipotle peppers. Heating them directly on the stove can cause them to release fumes similar to pepper spray. It's best to coat food with chipotle once it has been cooked. Store in airtight container in pantry. Keeps very well. If re-hydrated and canned, refrigerate after opening and use within 1 week.